Inside: Ready to have the best time ever this summer? 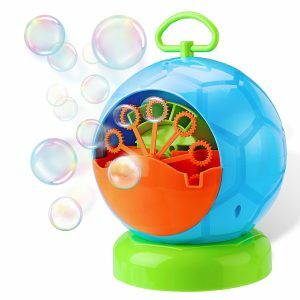 Here you’ll find the 16 summer toys for toddlers so you can have a blast making memories together. Plus, find the printable bucket list of over 50 activities to try this summer. I was sitting in my backyard with the sun spilling its warmth over my skin watching my kids running through the bubbles that were lazily floating into the sky. It was as if all the busyness of life was on pause and I was just enjoying the moment to soak in the sound of my kids laughing. This, to me, is what summer is all about. 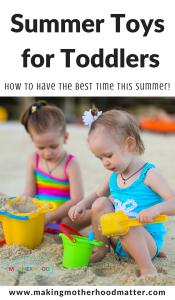 Making memories and doing fun summer activities for toddlers. It’s about eating watermelon popsicles, staying up a little too late, and squeezing every ounce of fun out of the day. 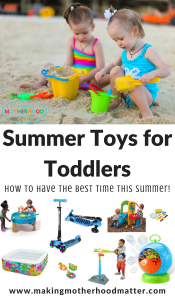 That’s where this list of the top 20 summer toys for toddlers comes in to help you have the best summer ever. 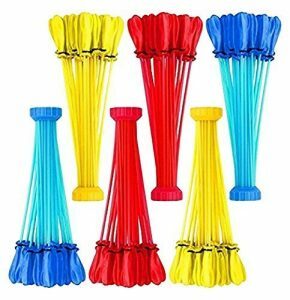 Water balloons are a classic summer must-have, but now they are easier than ever to fill so you can spend your time playing. We even play a fun learning activity with them called ABC splash. My kids play for HOURS in the bubbles, no exaggeration. It’s like the gift that keeps on giving. This one is a must. 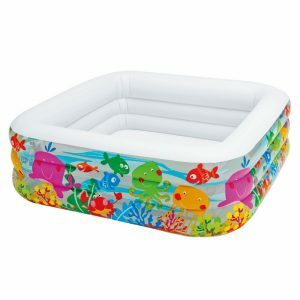 On a hot day, it’s hard to beat a lukewarm kiddie pool. Toddlers love splashing in the water to cool off. And we use ours to double as a DIY foam machine pit. Does it make a mess? Perfect! 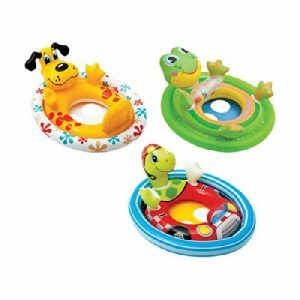 Toddlers love playing with messy toys in the sand or water. 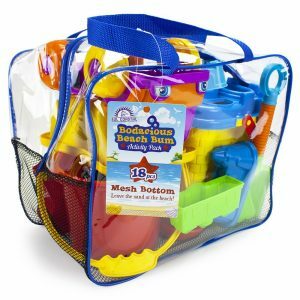 I love that this beach toy bag comes with a mesh-bottom bag, because it helps make it easier to clean up. Water tables are the best, just ask my toddlers. 🙂 The kids can get wet and have a fun sensory experience playing with the water table. 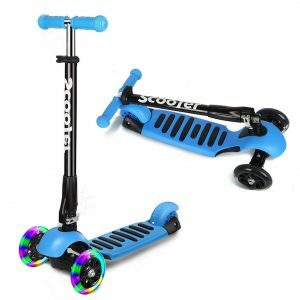 Scooters are a great way to get some exercise in the summer months. Here is a video of one in action. 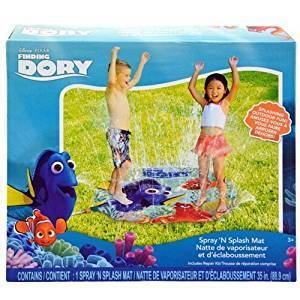 This splash mat is a blast and can provide hours of entertainment. My kids love the thrill of running through the chilly water on a hot, sunny day. 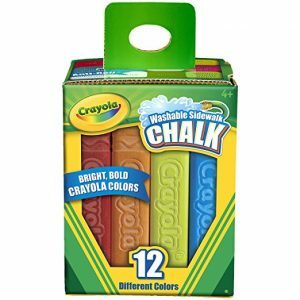 My toddlers love playing with sidewalk chalk to make mini masterpieces. 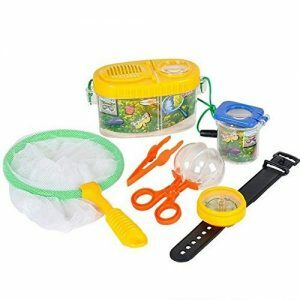 What better way to explore the outdoors than with a bug adventure kit. 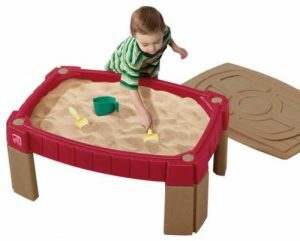 My kids will play with their the sandbox for hours. It’s tons of fun and one of our favorite summer toys for toddlers! 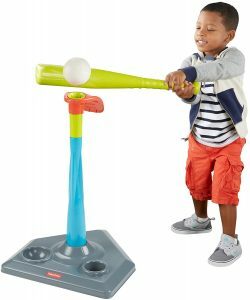 A tee ball set is a great way to have fun and practice hand-eye coordination skills. 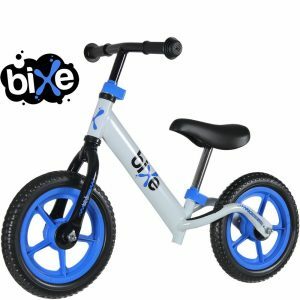 A balance bike is a great way to burn energy for toddlers and enjoy the outdoors. Being in the water is a great way to enjoy the summer. We love using pool floats for our toddlers, and here are some tips for summer safety for preschoolers. We have so much fun on a trampoline. You can use it outdoors and indoors. 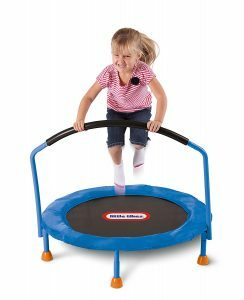 In fact, we have created a fun obstacle course using the trampoline. Slide down the slide and drop the balls down the side. This climbing set is sure to provide hours of fun in the sun! 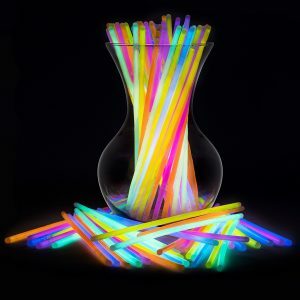 These are so much fun to play with as the night gets dark. We play hide and seek with them or just use them as bracelets. Bottom line is they are super fun. Whatever summer toys you choose I hope it’s a great one! We will be busy checking off the items from our summer bucket list and playing outside in the sun. 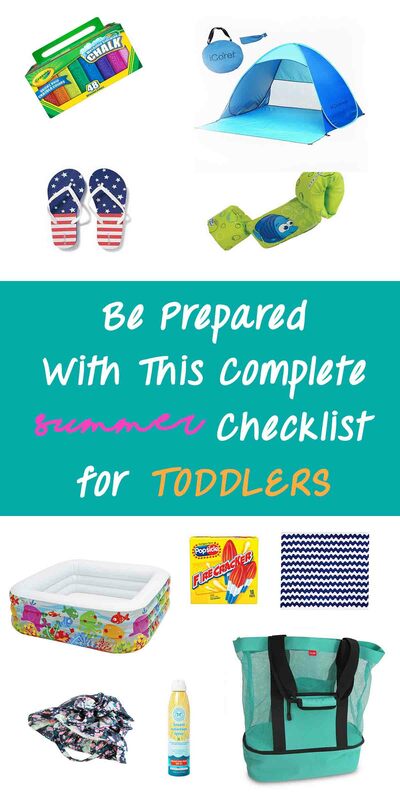 What is a must-have item on the summer checklist for toddlers in your home? P.S. 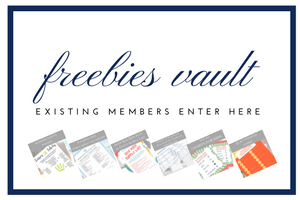 If you enjoyed this post, you may also like How to Easily Plan Super Fun Family Vacations, including a free printable packing list for the whole family. Great list - will be referring to this when I'm packing for our summer vacay to Europe this year :) Oh, and beach tents for the win! I used to say to myself - I'm not gonna be one of those parents. Well, I am. @Tina Pik Thank you. Yes, I love the beach tent. It makes napping a little one so much easier, when you are not at home. Hope you have a great vacation! All great supplies to have for a fun summer with the kids! Fantastic list...we want to come play at your house! :) Yes, we love to play hard over here!